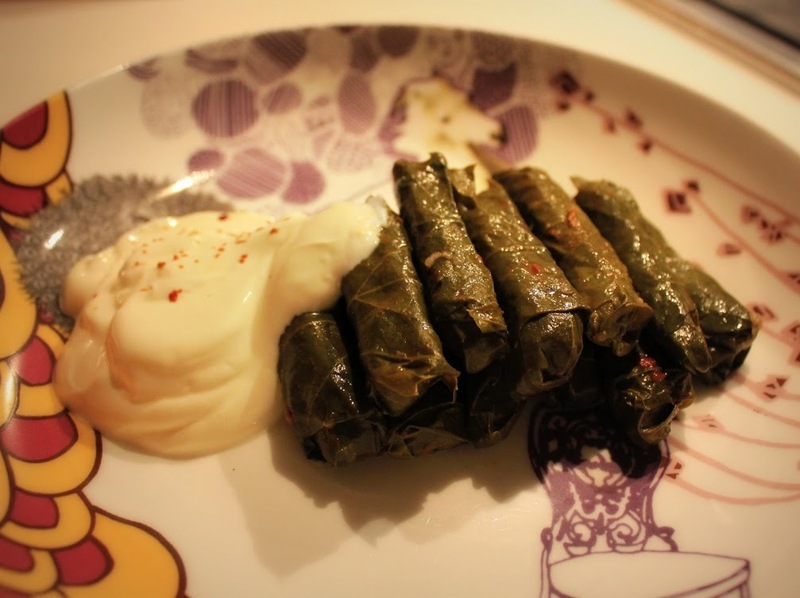 50 Vine Leaves – soaked overnight in warm water. Drain vine leaves and squeeze out excess water. Pick stalks off and prepare a surface for rolling. Mix rice, bulgur wheat and chopped onion together in a bowl, rinse and drain. Add dill, pine nuts, sultanas, parsley, mint, chili, salt, pepper, 2 tsps sunflower oil and 1 tsp of pepper / tomato puree. Mix thoroughly by hand. Lay out leaves with veiny underleaf facing upwards. Take 1 tsp of rice mixture and place at end of leaf where stalk once was. Fold edges over mixture, and tuck in sides while rolling into a cigar shape, about 1.5 – 2 cm thick. (See pics here..) Make sure you don’t roll them too tightly; the rice will expand while cooking! Place rolls snuggly into saucepan, cover with lemon slices & olive oil. Mix 1 cup hot water with 1 tsp of pepper / tomato puree and add to the pan. Bring to the boil, turn heat down to minimum and cover. Cook until liquid has been soaked up and rice is cooked (about 15 – 20 mins). Enjoy with a dollop of strained yoghurt.